In the last 5 years, I’ve been able to do a lot of family tree research. Many hours staring at the computer consisted of finding missing pieces of my family, my husband’s family, and friends’ families. It was addictive to find people I had never met, who had a part in who I am today. The farther back in history you can go, the more exciting it can be. The treasure hunt of information never really ends if you have the right names and know a little about your family. Once you get past the 1820s, information becomes easier to obtain due to lack of privacy laws that exist for the living or recently deceased (recently meaning the last 100 years). I was lucky to get part of my family tree into the 1200’s with my oldest ancestor, John Cameron, born in Perthshire, Scotland in 1226. That is an extreme example of genealogy. Most people are happy to find Great Great Grandparents, dates of birth, and where they had come from originally. I used to build on the family tree without thinking about the actual people’s lives I was recording. Until I found my father’s death certificate (1987) and realized the information on it was vague and mostly incorrect. It stated that he had died of heart disease when in fact he died of complications of diabetes. I began to pay more attention to death certificates from that point. It sounds gruesome, but death certificates hold a wealth of knowledge for the amateur genealogist. A death certificate can tell us family names, birth dates, next of kin, causes of death, and family history of disease. I kept stumbling over “causes of death” that sounded very archaic. Many of the terms they used are no longer used. Terms like dropsy, dementia praecox, overlaid, dysentery, and myxedema are rarely used anymore in modern Western Medicine. But those diseases still kill millions yearly, even when treated by Western Medicine. Dropsy describes edema, usually of unknown origin. In modern medicine, Congestive Heart Failure, kidney failure or liver diseases would be noted before edema as the cause of death. Dementia has many names now such as Parkinson’s or Lewy Body Dementia, Alzheimer’s or vascular issues that would be noted now as cause of death. When Hypothyroid Mom ran an article about the first recorded accounts of the clinical features of adult myxoedema or a hypothyroid state, I was intrigued. 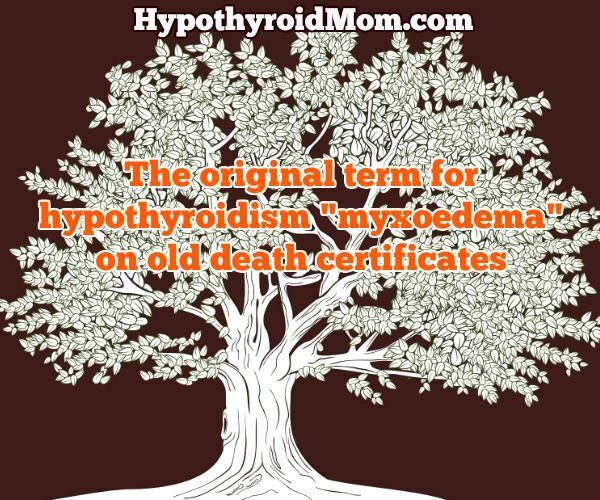 I had seen this term “myxoedema” (sometimes spelled “myxedema” or “myxodema”) many times on death certificates of women in their 30s-60s. No other explanation was given for cause of death. Seeing the root word “-edema”, I assumed it was a heart or kidney disfunction and moved on. Now I have looked back and see the connection of these women’s deaths. They died of hypothyroidism that wasn’t treated or wasn’t treated well. Here is an example of a death certificate that I discovered. I’ve cancelled out some of the letters in her name to avoid family discovering their great-grandmother or great-great-grandmother’s death certificate displayed publicly here on Hypothyroid Mom visited by over one million people. William Ord was the first to coin the term “myxedema” in 1878. What we now call “hypothyroidism” was originally named myxoedema or myxedema (myx meaning “mucus” & edema meaning “swelling” from ancient Greek). People who suffered from severe hypothyroid dysfunction were called Cretins. Another term found on a few death certificates. Cretinism is a condition of severely stunted physical and mental growth owing to untreated congenital deficiency of thyroid hormone (congenital hypothyroidism). In 1912 the Japanese physician Hakaru Hashimoto was the first to describe the symptoms of persons with struma lymphomatosa, diffuse infiltration of lymphocytes within the thyroid, or Hashimoto’s Thyroiditis. Sadly, many people died in a stupor or of heart conditions due to untreated high blood pressure, kidney issues, and mental decay from hypothyroidism. After the early 1900s death certificates no longer list myxoedema as a cause of death. It isn’t that people aren’t dying of thyroid complications. It’s just that the death certificates will now list the co-morbid health issues such as heart attack, diabetes, dementia or diseases of the kidney, lung, or liver as a cause of death instead of the real reason you had those health problems in the first place which is your untreated or poorly treated thyroid. Not much has changed in over a century. Hundreds of millions of hypothyroid people around the world are undiagnosed and the rest are treated but far from well enough. Hypothyroid people still suffer complications of heart disease, diabetes, kidney and gallbladder diseases, lung infections, and mental decay. I’m hoping that future genealogists don’t shake their heads at the ignorance of our generation’s lack of quality treatment for this all encompassing disease. GayLynn Fisher, amateur Genealogist, Mom of 2, Jackie of all trades and obsessive compulsive researcher of anything that catches my eye. I am a 50 years old female diagnosed with Rheumatoid Arthritis 2 years ago but have had symptoms for at least 20 years. I was taking methotrexate and Cymbalta, as well as infusions of Remicade, nothing worked for me. All my pain was from my waist down and certainly not something I can stand. The only treatment that has been successful has been the taking of RA herbal remedy i purchased from Best Health herbal centre. I now wake up every morning without pain. I have been pain-free period for more than 4 months. I have regular blood tests and do not experience any of the side effects from taking the herbal remedy. Thank God this works for me. I feel great!. Contact Dr linda(drlinda @ besthealthherbalcentre. com) or via ww w .besthealthherbalcentre. com for your RA herbal remedy thanks…….